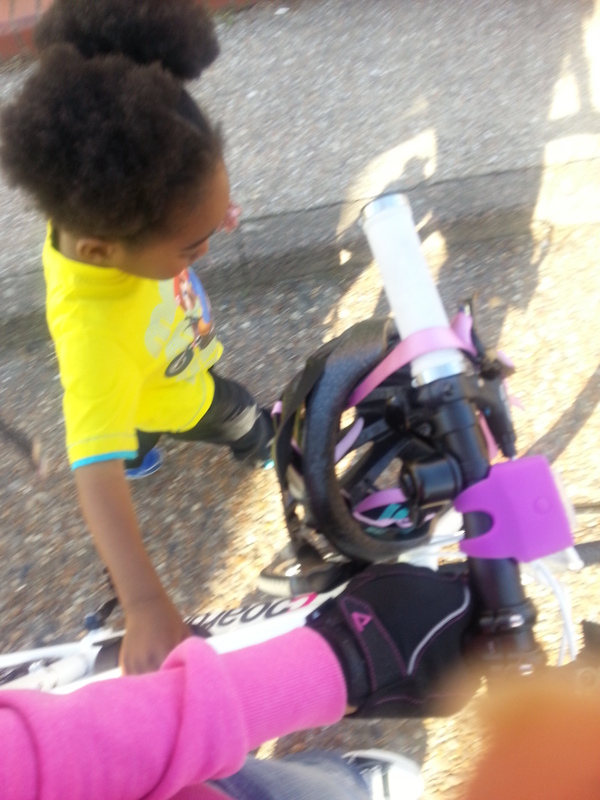 mangoandlebsgocycling | when a city mummy takes up cycling! when a city mummy takes up cycling! So how is summer treating everyone? We have recently enjoyed (or suffered, depending on your viewpoint), the longest heatwave in seven years! How have you spent it? Lebs and I have been having great lots of fun! 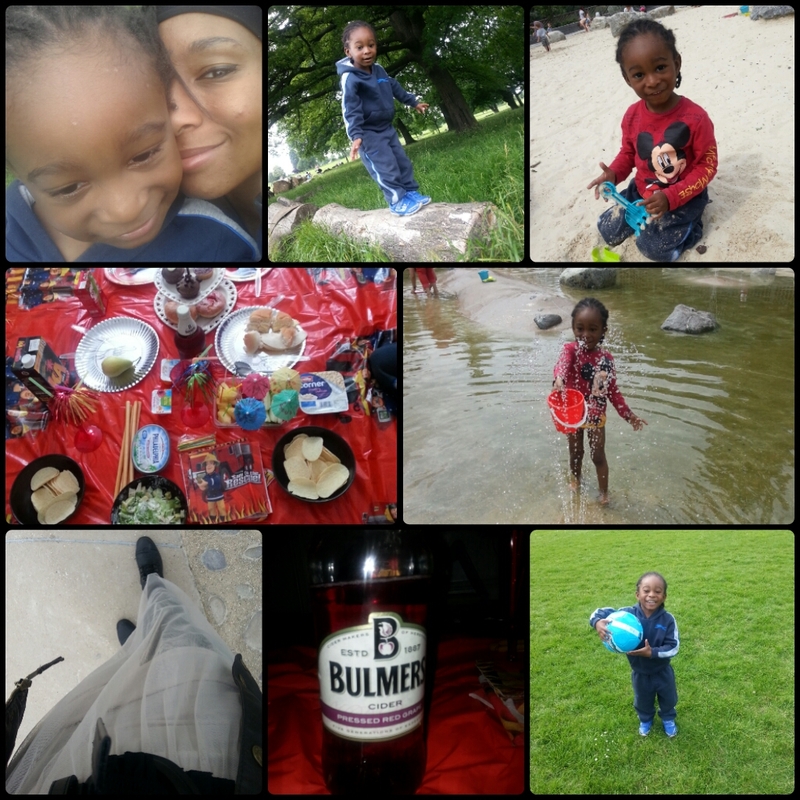 We have had some indoor and outdoor picnics (Bulmers for mummy please! ), and plenty of trips to Brockwell park. It’s great to ride there by the way, very bike friendly and perfect for beginners! Lots to do at Brockwell park! I was convinced through a lot of trolls on social networking sites that all cars hate me and want to kill me. This was too much for me before my lesson (I’m serious). It took a near miss to spur me to action against all these inhibitions. One day I was cycling with Lebs on the back to his nursery when I turned left out of a t- junction and found that two cars were coming towards me, and one behind me was about to follow me around the bend. I was instantly afraid and so sought the nearest passing place and tucked myself in. It hadn’t occurred to me that the driver turning left behind me would swing round quickly, become spooked by the two cars approaching and swerve into the same passing place without looking first, very nearly taking me and Lebs off the bike. I was shaken up(more even then my first ride out on a bike with Lebs), and not only that, I couldn’t help but ask myself; was there some way I could have avoided that situation? That night, I took to the Lambeth website with hopes of finding some information on cycling courses which would help me. There was lots of information to be had (see here), but best of all I saw that anyone living, working or studying in Lambeth could get FREE cycle training! One-to-one! No download speed in the world could have opened the page fast enough for me! I found myself on Cycle confident website, where I left a session request briefly explaining my fears and what I felt my experience level to be. A few days later I received an email from Nick, inviting me to book a session. Nick was very flexible. I originally had asked to meet at a local park but after a phone conversation about my abilities he was happy to meet at my house and go straight onto the road. On the morning of the session, Nick was nice and early. He was warm and chatty, so I felt a little less nervous (it felt a bit like being in school again). He checked my bike over to make sure it fit me correctly and that it was road worthy and then off we went! We did a few basic loops in the streets near to where I live in Streatham Hill. I am lucky in my area in that there is a good mixture of hills, and flats, back streets and main roads, cycle lanes and junctions. Nick cycled slightly ahead of me initially and then behind me. He tutored me on using gears and my road positioning. It seemed the simplest adjustments made the world of difference. Within 5 minutes, having changed my hand and foot positioning, I was already feeling more confident. Better still, Nick lives and rides locally, so he was a gold mine of information about local roads, routes and even cycling groups. My fear of hills was swiftly conquered with some guidance and practice on using my gears. I learned what it is to ‘spin’ (owwww), and conquered my first proper hill. Not just a bump or a lump but a proper up-and-over hill! I had breath to spare too! I was so pumped I think I broke the world record for saying ‘thank you’ in 1 minute. Next my fear of turning right. This involved schooling on my road positioning. He showed me how staying in the gutter as religiously as I was could become potentially a hazard for other road users or cause me to panic. In fact, all of my other fears were calmed by Nick demonstrating to me how important it was to look ahead, stay calm and stay SEEN. He also consulted my attitude towards drivers. He understood that people might be grumpy sometimes but if I am staying seen, making a little eye contact where possible, not swerving in or out of lanes and signalling clearly before maneuvering, then road user grumpiness will be minimal. Next we hit the main roads. Nick showed me how to position myself safely at the traffic lights and how to use the cycle lanes safely. I was finally feeling very confident and Nick tested me out! 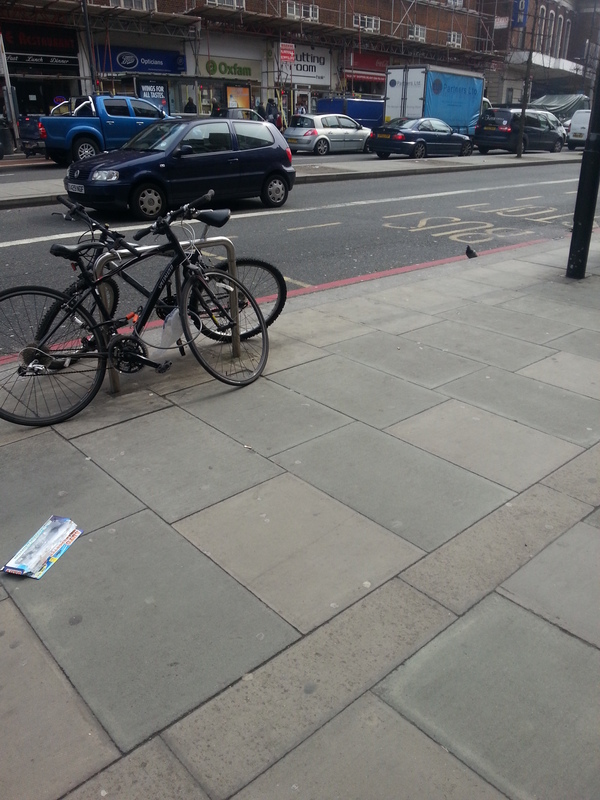 We did a big loop along Streatham High Road back to my home where the lesson ended. HE told me that we had completed 7 miles and I almost passed out with happiness! I had never thought I could do 7 miles and still have breath! I wanted to straight back out (and I did, the next day). Since my lesson I have not only used my bike more often but I have had some waves and compliments from drivers (they can SEE me yah), and conquered a few more hills! The best experience of all was when I took Lebs to nursery and he said “mummy lets take the flat road ‘cos you can’t go up the hill”. I cleared the hill and he whooped for joy “Well DONE mummy!”. I was so proud! What’s your proudest cycling moment? This entry was posted in Uncategorized and tagged beginner cycling, bike, cycle confident, cycling, cycling course, Lambeth, mummy cycling, stay safe, stay seen, Streatham on August 12, 2013 by mangocherrysteph. I’m super excited as a newish blogger to have passed that first 1000 views and just wanted to say a massive me-and-Lebs sized thank you for stopping by and taking time to leave comments! I’m writing about my Cycle Confident course next so stay tuned… better still, sign up for email notifications. 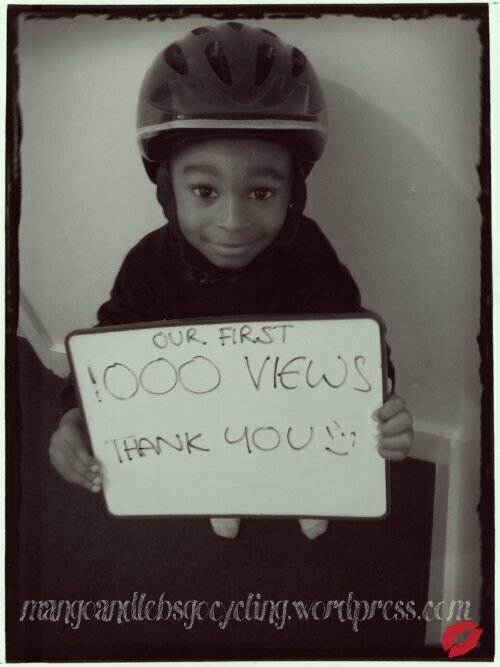 This entry was posted in Uncategorized and tagged 1000, bike, cycle, cycling, exercise, fun, Kids, mummy, new blog, thank you, thanks, views on July 2, 2013 by mangocherrysteph. Well it has been a while hasn’t it? I’d love to say I have been clocking up some serious miles and gone from beginner to semi pro in cycling skills … Alas, in truth whilst I have taken some commutes to work, I haven’t had as much time as I’d hoped to go cycling. 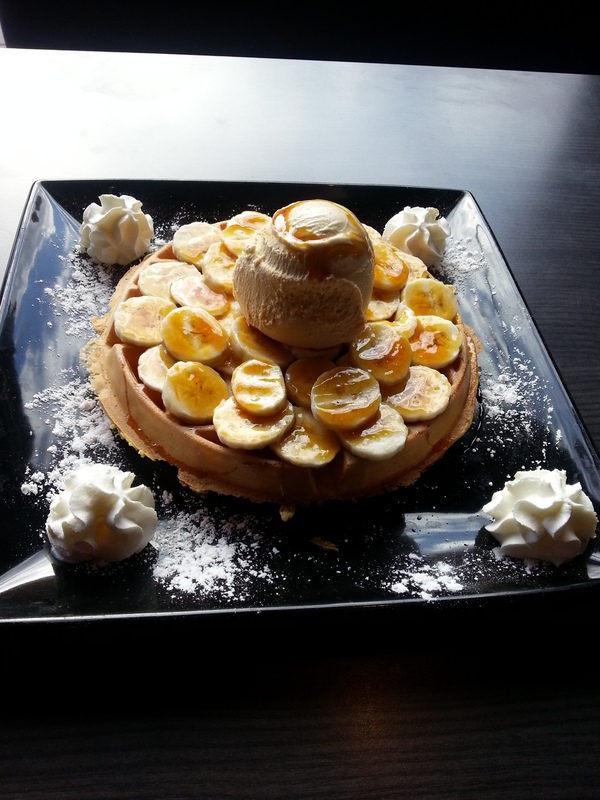 Hot waffles with bananas and toffee ice cream and caramel syrup… and cream… so naughty! Extremely yummy but all I want to do after such treats is relax and read a gossip magazine! Another issue I have encountered is Lebs hair! Normally, I plait it, so using a helmet is no problem. It also means that I can still go cycling when I want to, without having to find a baby sitter first. However Lebs scalp has recently been very sore so I have had to give the plaiting a rest. But there is no helmet for Afro Thunder! So no passenger ride for Lebs for now. 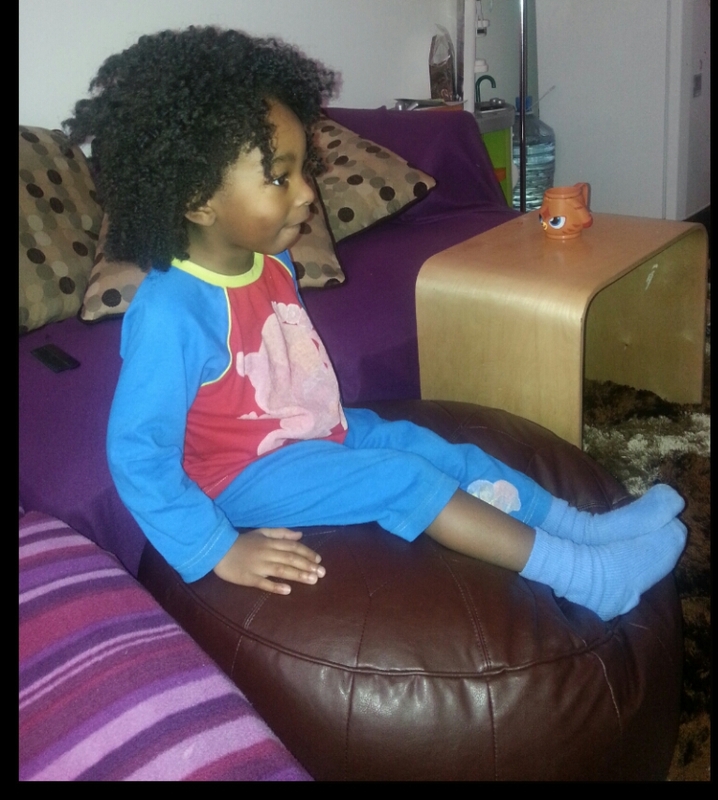 I’ve found out that Caroline actually is really great for leading Lebs home from nursery. So we walk to and from nursery and I can ride the rest of the way to work. Lebs walks faster whilst holding onto Caroline! I’m frustrated though that I haven’t been able to go on longer rides. What I would like from cycling besides all round fitness is stronger legs, a more toned shape. My work is not far enough from home for me to harvest the results I would like. I discussed my worries with a cycling friend who also has commitments and was advised to try Hindu Squats between riding days. But then I tried them! I started to feel results within days. (See a demonstration here ). And there was no need to do hundreds of them! In fact I was so excited to feel the beginnings of muscle bulge in my thighs that I hurried out to try a hill near to home which normally proves troublesome… I cleared it! It was still hard but I felt empowered by my new strength. Suddenly I felt I had finally progressed from my first time! So I will be continuing with these until Lebs hair back on the bike with me once more, and beyond. What kind of exercises do you do between rides? All tips are welcome! This entry was posted in Uncategorized and tagged bike, body conditioning, Commute, core strength, cycling, hair, health, hindu squats, Kardashian, Kids, London, mum, mummy, Physical exercise, results, sport, squats, strenth, toning on May 31, 2013 by mangocherrysteph. These cyclists made me smile in Camberwell. 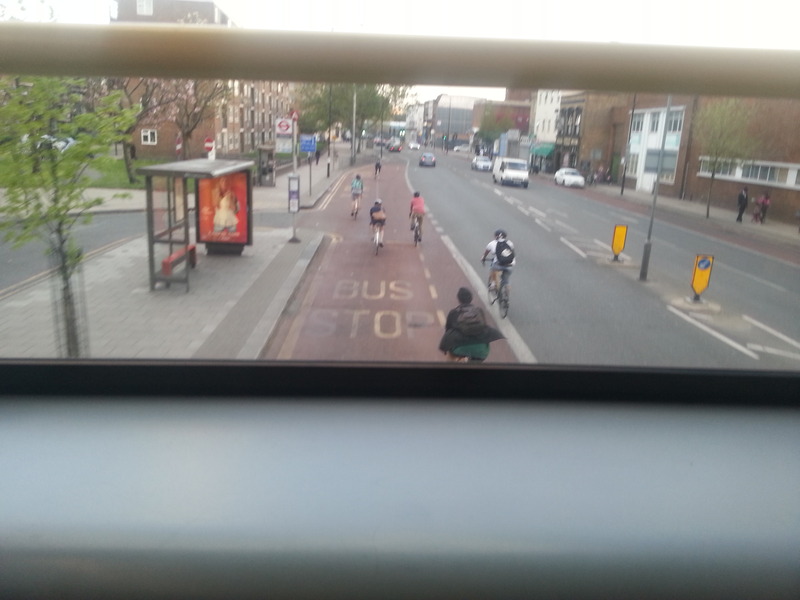 They were not together but ended up cycling together and I wanted to jump off the bus and join them. All that’s missing is the cycle lane! Have you ever been tempted to do this due to lack of bike parking? Mountain Bike at Mount Nod! I am slowly getting more confident on getting about with Lebs locally in SW16. I haven’t quite conquered the main high street with him yet, so I’m lucky it is still easily reachable via several back streets! The thought of pedalling furiously down the highroad in the bus lane with Lebs singing Fireman Sam songs and 2 or 3 buses looming over me just isn’t appealing to my sense of fun yet! 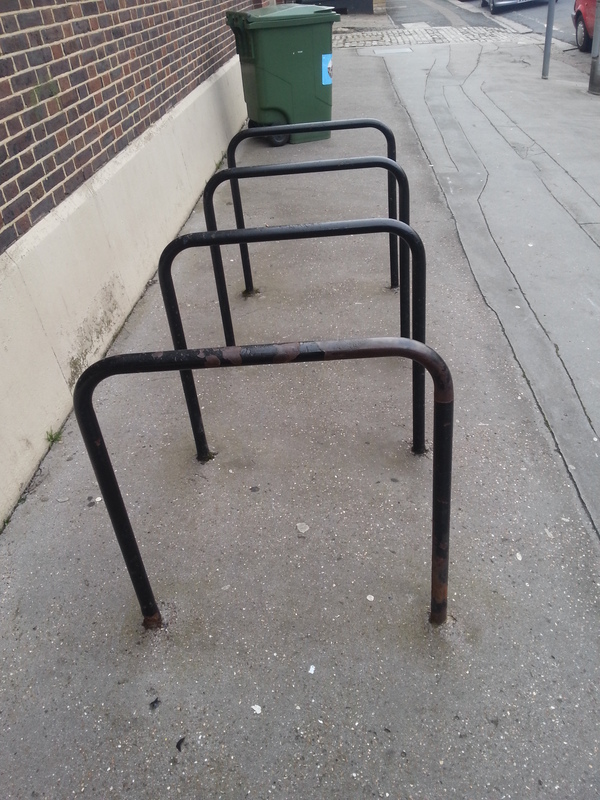 Later, at the nursery (also Streatham), the only place I could find to stick my bike was by the kitchens. My D lock couldn’t fit around the fixture there, so it’s a good thing it came with a cable. 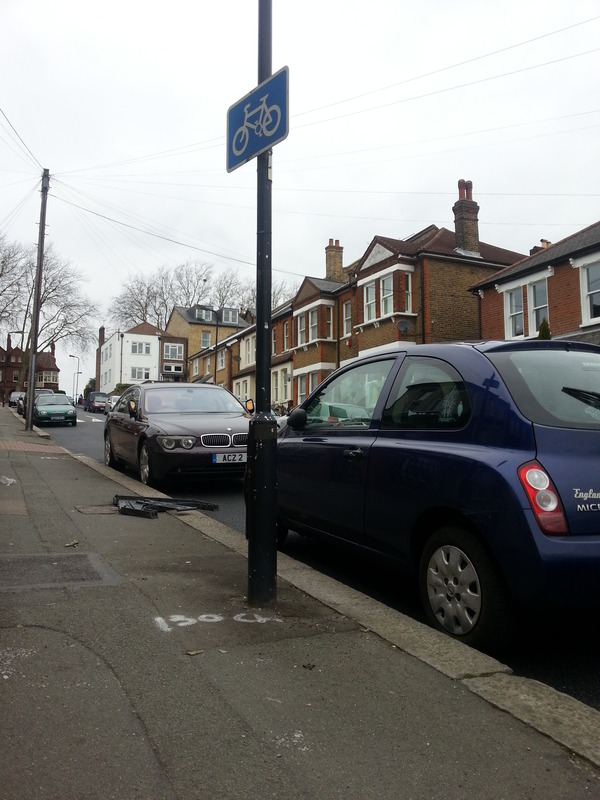 There was no cycle parking outside on the road, probably owing to the fact that the pavement is narrow. I noted that there is plenty of car parking provided in the nursery and most establishments along the same route. Norbury is run by the Croydon borough whilst Streatham is within Lambeth. It’s such a shame to find the rails in Norbury largely unused. I think the placement of them is worse than Streatham. Why so many outside the library which is not particularly close to the other shops and banks and less along the main high street? 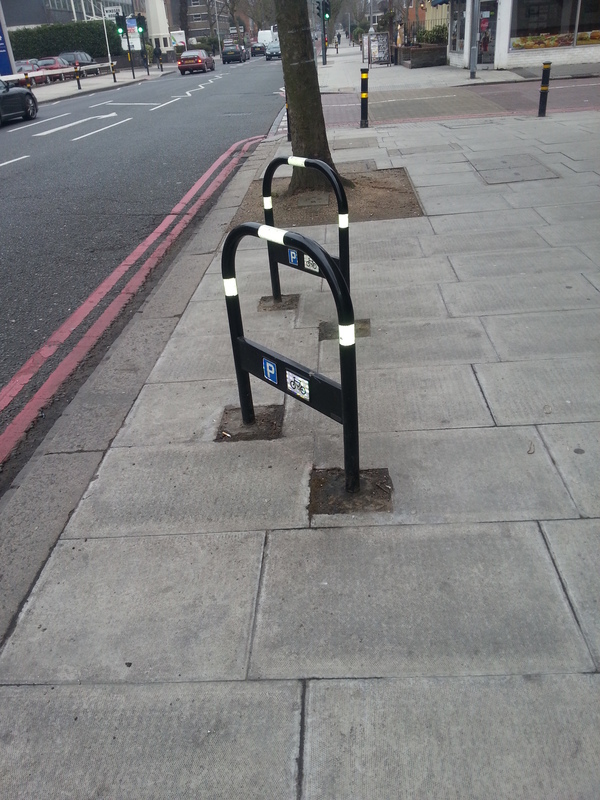 It would be wonderful to see reflective strips on the bike rails in Streatham and more of them. 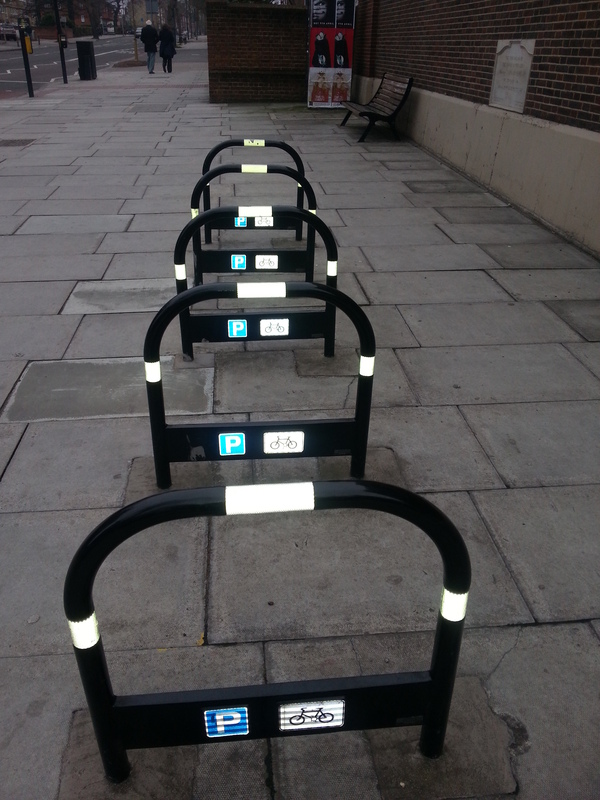 I think the Streatham cinema is very central and would benefit from more cycle parking. What do you think? 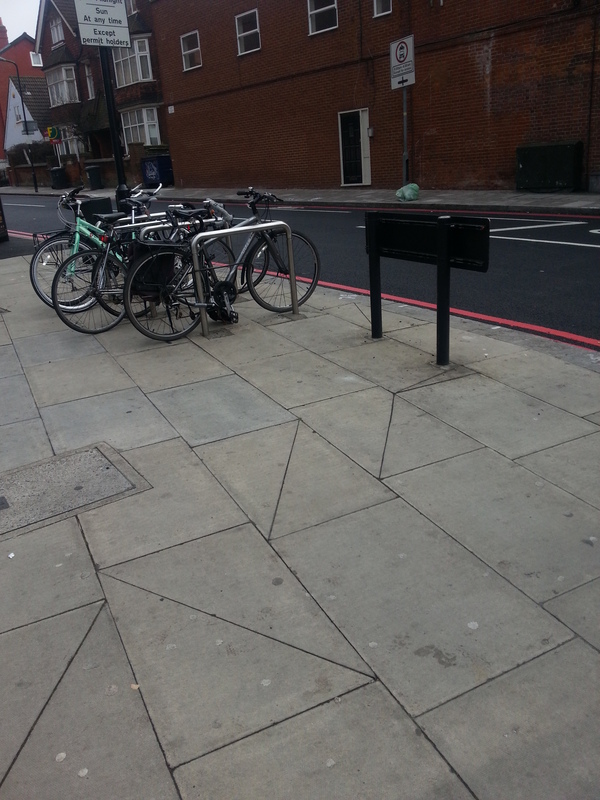 Do you find cycle parking sufficient in Lambeth? 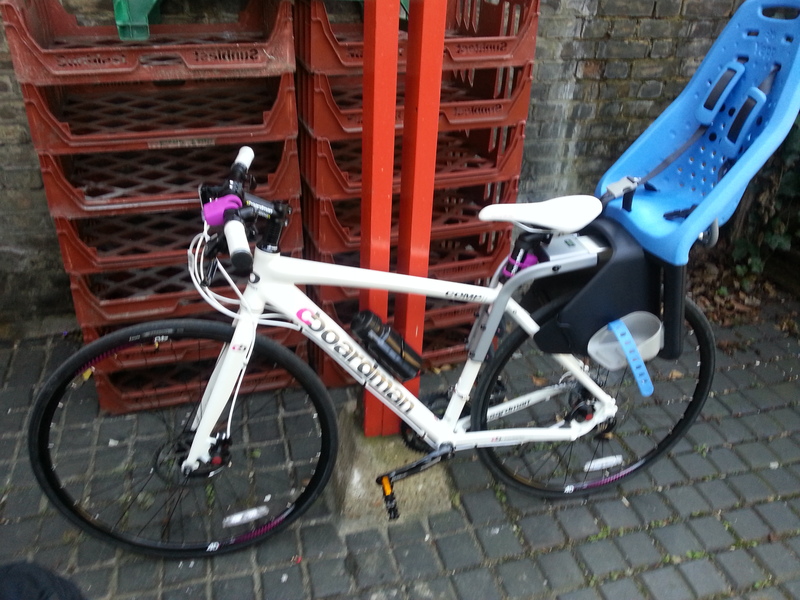 This entry was posted in Uncategorized and tagged Bicycle, Bicycle Rail, Commute, exercise, Lambeth, London, mum, mum and baby, Norbury, Parking, Stationary bicycle, Streatham, SW16, two wheels on April 17, 2013 by mangocherrysteph. I’d waited over month for my Cycle2work voucher, and spent almost as much time reading bike information and reviews on the Halfords website. 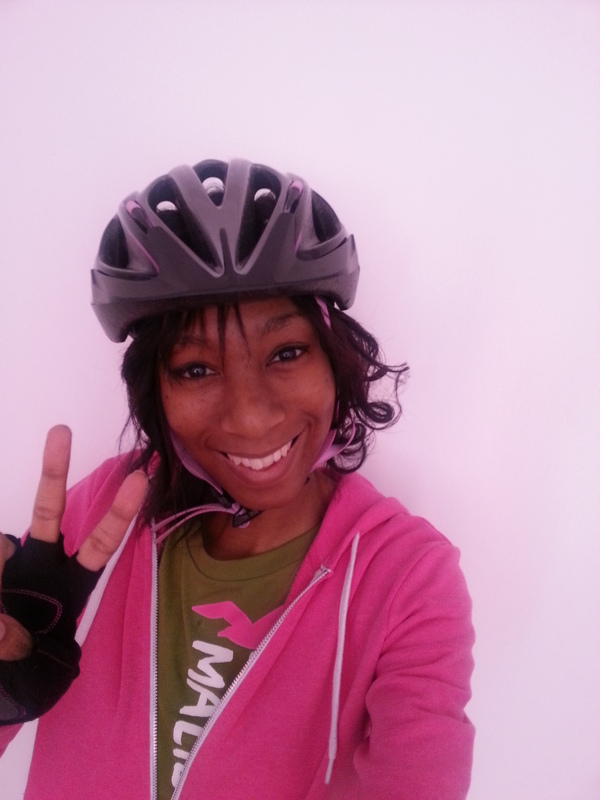 I’d chosen safety equipment and the perfect bike seat for Lebs (find out how I made my final decision on my bike here). Yet my first time on a bike since I was around 7 years old was still a bit of a disaster. Firstly, the bike decided to be fashionably late. I’d been to the store, and had an informed chat with a young man by the name of Lance on a sunny and quiet Monday morning. He helped me to order most of the things I’d researched and suggested solid replacements for the things he could not and I arranged to pick up the bike on Wednesday (my day off work). I figured that I might be able to dispatch Lebs to a relative whilst I collect and walk the bike home – possibly even having a little ride if I was feeling brave. All of the stuff turned up to store the following day but the bike did not. Actually, the bike which was ordered never arrived at Brixton Halfords and lovely Lance collected one from Balham instead (I never established if it was still built from the box or taken from a display there – ignorance is bliss). This meant that I now only had a Sunday, my other day off to collect my new bike. I had no childcare. I explained to Lebs what I wanted to do and he was very excited – he loves anything with wheels at the moment – so off we went together with him clutching his blue helmet to collect the new bike. I got to the store to find that being Sunday, there was no Lance. My heart immediately sank when I was greeted by a friendly young man (young and high pitched enough to make me feel old even though I’m not quite thirty). He was polite but it quickly became clear that he knew almost as much about bikes as me, and on that day I could write all my knowledge about bikes on the back of a postage stamp. Besides advising me with well rehearsed speech on what lock I should buy and fitting the bottle cage to the bike there was little point asking him anything else. The poor guy had no idea how to process the cycle2work voucher and whilst I was trying to be as sympathetic and patient as possible, Lebs was not and started to jump on the floor, make loud protests and ask every innocent customer who should pass him what they were looking at. Next, there was no where adequate to rest the bike before putting Lebs into his bike seat. It was leaned awkwardly against the corner of the display. It took the two of us to put him into the seat and figure out how to adjust the straps. The young man could not give me any assistance when I inquired as to if and how the child seat could be removed for solo rides. Now I WAS beginning to get impatient. Then I was told goodbye (a little too enthusiastically I thought) and attempted to leave. I say attempted because I had no idea that the weight of Lebs would affect how I moved the bike so dramatically. I tried to turn the bike and nearly dropped Lebs on the floor. He found it hilariously funny and the assistant tried to help me through the narrow aisle but it quickly became clear that this would be counter productive. He knocked the bike and one of the pedals spun and bit into my leg. So, red faced and in pain, I grunted something like ‘I’ve got to learn to do this anyway’ and wheeled Lebs very unsteadily out of the shop myself. All the staff that hadn’t been around before suddenly appeared to be there staring at me like the stupidest creature that ever hit the earth. It wasn’t until one of my cycling enthusiast pals looked over my new bike a few days later that I found it should have been fitted for me. It hadn’t even occurred to me! I assumed it was the same as how I shop for clothes. I know my size, I see something I like, I find the said size and purchase. I’m straight forward that way. On a previous chat with Lance we had decided that an 18″ bike was the correct size for my height and I assumed that’s all there was to it. My pal has since made some minor adjustments such as raising the saddle and lowering the breaks and now my bike is so much more comfortable. I live about 1.8 miles from Brixton Halfords. It’s a 40 minute walk over Tulse Hill that I’m very used to performing with ease. It was a cold, grey day and I was dressed in layers with a long coat. I had thought that I could walk the bike back with Lebs on it but within a few steps it was clear that if Lebs was in his seat, I needed to be on my seat too. So nervously I got on, almost tangling myself up in my coat doing so, and started to pedal. I assumed that I would be the first person ever to forget how to ride a bike but after one clumsy attempt (I was a bit nervous of the pedal hitting my leg again), I was off! When I say off, I mean wobbly on the pavement off, not cruising down the main road as I had envisioned. However Lebs began to whoop with joy and sing and I, pleasantly surprised by how smooth and fast this mode of transport was compared to walking, couldn’t help smiling. Cheesy but true. I had NO idea what hot thirsty work it is on the pedals. Anyway I made it home in one piece thank God, after stopping 3 times for breath, cursing the terrible quality of the roads more times then I care to remember and also having some real cyclists shout things like ‘Oi oi wobbler!’ laughingly as I passed. Then I had to hoist the bike up a flight of stairs to my flat with the seat still on the back (as it turns out the seat can come off so easily even I can do it). I have to turn a tight corner at the top step between my neighbors door in the hallway and my inside balcony. I have to hold the bike vertically on its back wheel to get up the stairs. It’s 11.5kg I believe but with the bike seat and adapter attached it is somewhat heavier. Up until this point the heaviest thing I was accustomed to picking up was Lebs so you can imagine how much I struggled up the stairs. It wasn’t until I was halfway up the stairs that it dawned on me that I should have take Lebs out of the seat first… No I’m just kidding about the last part. Anyway at the top step I think I hit my neighbors door with both handle bars, the saddle and the child seat quite hard. I really hope he wasn’t in at the time. I thought the bike would fit on the balcony just outside my front door but with the flat bar it would block the door and become a hazard. My managers words were ringing in my ears. Could I seriously be bothered with this palaver every time I wanted to ride? I dumped it in the hallway inside temporarily and flopped down on the sofa. Being a modern girl, I logged straight into Facebook before I even took a drink. 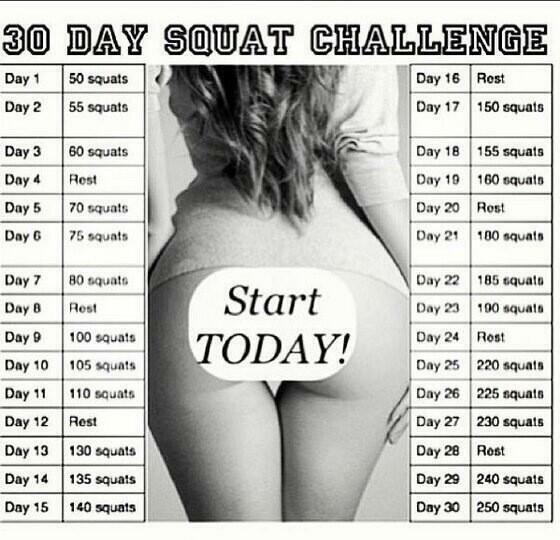 I decided I quite like the burning jelly sensation setting in around my legs and stomach and wanted to do this again! So maybe it wasn’t so much of a disaster after all. This entry was posted in Uncategorized and tagged bike, bike fit, bike seat, bike shop, cycle, Cycle2work, cycling enthusiast, cyclists, disaster, exercise, first time, Halfords, legs, mommy, mum, mummy, new, Sports on April 4, 2013 by mangocherrysteph.